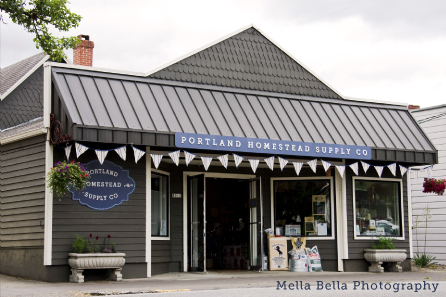 Kristl and Doug Bridge turned their teaching skills into helping support homesteaders by opening Portland Homestead Supply Co. They sell everything you need for your own urban homestead. That of course includes candle making supplies. They carry beeswax in one pound blocks and soy wax in bags. If you would like to scent your candles with essential oils, they have a wide variety of them to choose from. Essential oils also come in handy when making your own soaps. Do you want to learn how to make soap or candles? Try taking one of their do it yourself classes! If you’re so inclined, you can also try your hand at canning, pickling, or even purchase a chicken or goat! It’s great how this homesteading store has taken off in the city! It appears that many people want to simplify by being self sufficient. According to Doug and Kristl, they’ve had 100 people visiting a day since opening on June 14. They’re located at 8012 SE 13th Avenue in Portland, OR and you find more information at www.homesteadsupplyco.com.